Magnetic Calendar Planners showcase your information every month, making a perfect keepsake! Show the year-at-a-glance with these vibrant calendars. Choose from hundreds of designs! A great value! Clients will be reminded of you each month as they peel off a page. Spiral-bound with full-color artwork and calendar on both sides of every page. MagnetCard Calendars are a premium laminated card with a magnetic strip attached to the back. 12 months, seven thick cardstock pages, 5"x 7" with full-color artwork, calendar, and your imprints on each panel. 4.8 out of 5 stars. See all 4500+ reviews on Google! 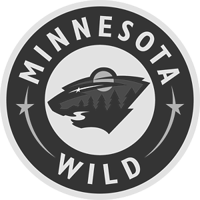 Your custom information is printed directly on the rounded magnetic topper. Customizable house-shape magnetic toppers showcase your real estate expertise. Stick your paper business card to the adhesive across the top. Quickest delivery! 16 perforated pages. Each page reveals a new month and eye-catching artwork. Themed calendars are complemented by inspiring tips and imagery for each month of the year. While each month is torn off as it passes, your marketing remains prominently displayed at the top. 12 months, seven thick cardstock pages, 5" x 7" with full-color artwork, calendar, and your imprints on each panel. Features a lightweight easel stand clients can easily assemble. Arrives flat and shrink-wrapped for easy mailing! 14 months, 14 pages, 4" x 6" with custom imprint area below on both sides of the tent. Spiral-bound with full-color artwork and calendar on both sides of every page. Easy to assemble and folds flat for mailing. Make a positive impression and show your best clients how much you value them with fridge Pad Calendars or Magnetic Calendar Pads! These large designs allow for plenty of space for clients to jot in notes and reminders. Feature a durable vinyl backer and your information printed on every page. Showcase your information on a durable magnetic strip across the top. 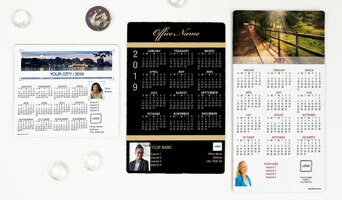 Calendar magnets featuring a fully-backed durable magnet. Also available in 2-Person Layout and Team Layout. 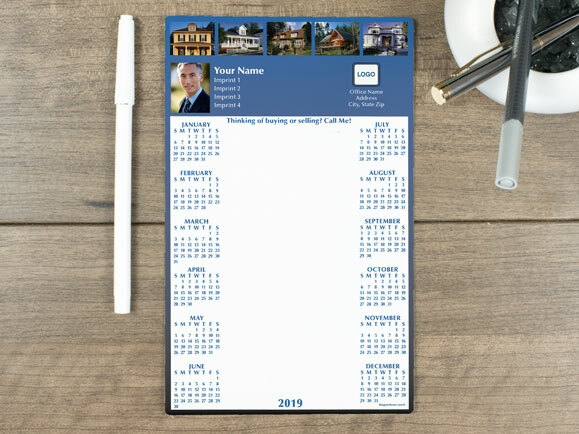 Calendar magnets featuring your business information with an included pen and space for jotting notes. I'm enjoying Magnet Street calendar magnets and have been for over five years. 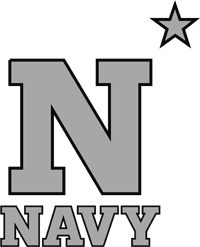 They can accomodate novices and experts with a design and product that consumers love. I recommend Magnet Street to all my colleagues and small business owners. I order magnetic calendars every year for the last several years. 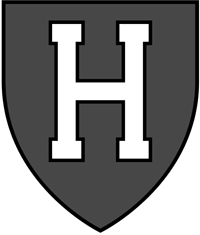 Each and every time they assist with my custom design quickly, answer any or all questions and deliver promptly. I have never been dissapointed. Love the calendars send them to clients every year and I always have request to receive them the next year. Great quality easy to order always ship on time. Always meets expectations when the calendars arrive. Thank you. Your business deserves marketing that you're proud to put your name behind, and proud to hand out to clients and prospects. So, why Calendar Magnets? Paper can easily be lost, torn, or thrown away. On the other hand, magnets are durable and are seen multiple times a day on the family fridge. They are built to last and offer 365 days of easy and continuous impressions. Pairing your strategy with something practical, like a Magnetic Calendar, turns ordinary marketing into an essential, everyday tool for clients to reference all year long. Clients will love the handy calendar, and you'll love the year-long impressions! 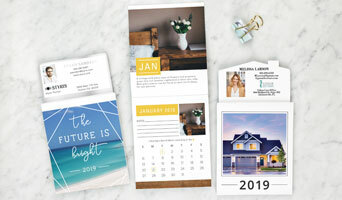 Whether you're a real estate agent, busy urban professional, or small town business owner ... MagnetStreet has the perfect magnetic calendar for you! Choose from many designs and sizes, then add your own personalized photos, text, and colors. 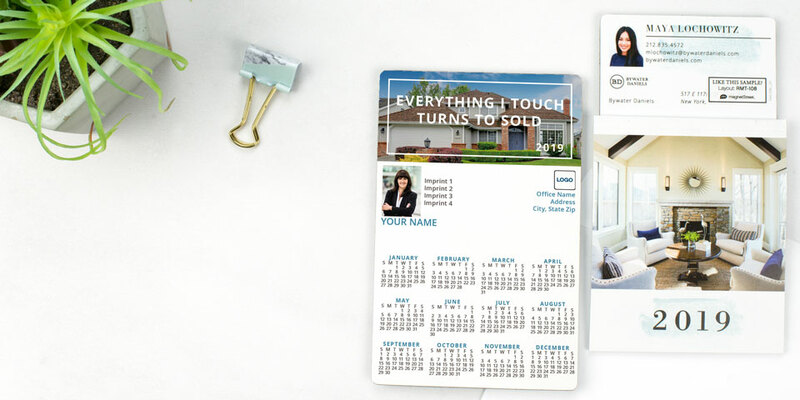 By providing clients active engagement with your brand, Magnetic Calendars deliver a lucrative trio of brand awareness, lead conversion, and customer retention. Full-Color Envelope Designs Eye-catching envelopes are just as essential as the materials inside. Boost your mailpiece open rates with professional-looking envelopes that are branded with your logo and address, and that feature full-color art elements tailored to the season or event. We'll verify your lists are efficient and accurate through our verification process. Filter by demographic data and fine tune a geographic area utilizing our convenient radius and polygon area selection tools. We will print and ship your products to your office for you to prep for mailing. Which Calendar Magnets will mail with one First Class stamp? Calendar Magnets that weigh one ounce or less will mail with a First Class stamp. We intentionally design our most popular products to mail for one-ounce postage. 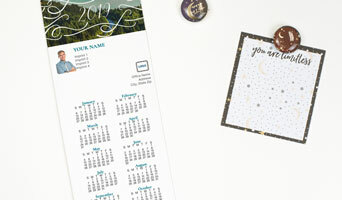 Calendar designs and sizes that fit within this limit include the following style codes: Full Magnets (A, B, C, CT, R), Small Memo Boards (GC without pen), MagnetCards (SIK) and Tear-Off Calendars (T, RMT, RMTH). Please note that First Class Mailing requirements are subject to change by the United States Postal Service at any time. How long does it take for Magnetic Calendars to arrive? Timing will differ based on the type of calendar ordered and if mailing services are added to your order. From proof approval, print time takes approximately 3-10 business days. Shipping times range from approximately 1-5 business days. How much can be customized on Magnetic Calendars? For most calendar designs, you can easily personalize the colors, photos, and fonts inside Design Studio, our online personalization tool. 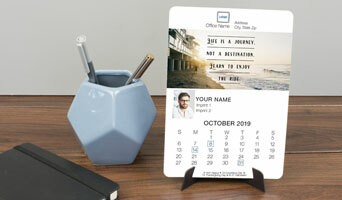 Customizations include adding your headshot, business and contact information; editing colors and fonts; and changing the scenic photo on the calendar magnet design. Scenic and home photos on Tear-Off Calendars and Magnetic Calendar Planners cannot be changed. Design Studio also allows you to note special design requests for our graphics team. Which holidays are shown on Tear-Off Calendars? What is the right way to put my calendar magnet in an envelope for mailing? There is not a 100% hard rule. However, the United States Postal Service prefers magnets to be inserted facing the back right side of the envelope, with the magnet facing away from the recipient's address on the front. How does the proofing process work for Calendar Magnets? You will always see and approve a proof of your calendar design before it goes into production. 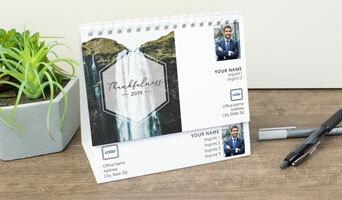 If you personalized your design through our Design Studio: You will be able to view and approve a digital proof of your calendar magnet before it goes into your shopping cart. Follow the onscreen prompts. Once you approve your proof, you can proceed through checkout. 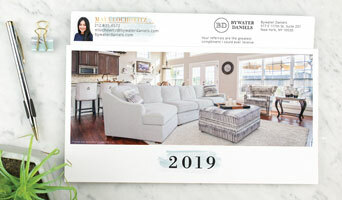 If you have requested special changes to your magnetic calendar design: After you have placed your order online, we will email you a link to see a digital proof of your design within 2–3 business days. Your order will not go into production until you have seen and approved your proof. Will calendar magnets stick to stainless steel appliances? Many appliances today are made to look like stainless steel, but actually contain magnetic surfaces. Most stainless steel appliances are not magnetic and have just a steel door, but typically the appliance sides are magnetic.